There’s definitely no shortage of different types of dating apps on the market, but even so, a large number of people haven’t had luck with any of them. Well, one awesome new app is trying to scoop up these dissatisfied users with a totally unique approach. Say hello to LuvConnect, a dating app for people who just want to click on pictures of tractors and never go on any dates! Download the app on your phone and create a profile. Once you’ve filled in some basic information about yourself (favorite movies, music, a brief bio, etc. ), you’re ready to jump in and start clicking on pictures of tractors. 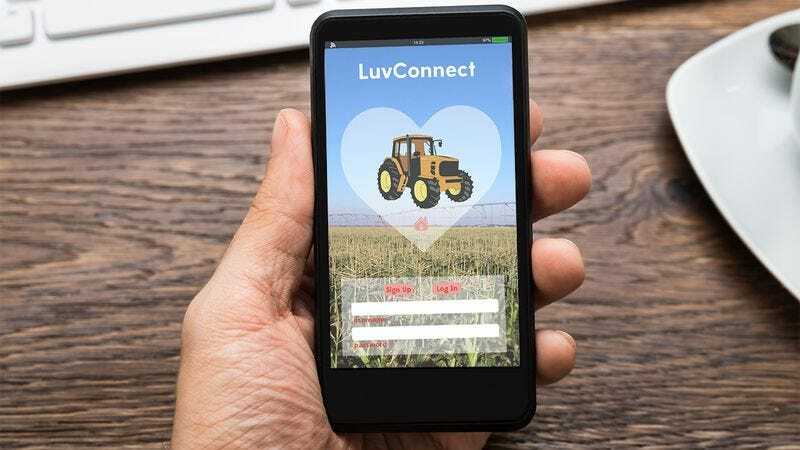 LuvConnect lets you click on tractor pictures once or even twice, if you really like the picture or just feel like clicking twice for no reason. Another fun feature is that you can browse other users’ profiles, but you can’t message or match with them in any way. Swipe left or swipe right—both actions just give you more pictures of tractors that you can click on until your thumbs get tired or your phone runs out of battery. Um, yeah, we want this yesterday. The dating app boasts a library of over 3 million clickable tractor pictures, including pictures of utility tractors, orchard tractors, garden tractors, and more. As far as we can tell, the app’s biggest flaw is that there are no pictures that feature two tractors in the same picture or three green tractors all lined up next to each other. But it’s still brand new, and hopefully the app’s creators will make that available in future versions. We’ve seen countless dating apps come and go, but this one seems like the real deal. Check it out!